Here is another fun photo to share for this #ThrowbackThursday. 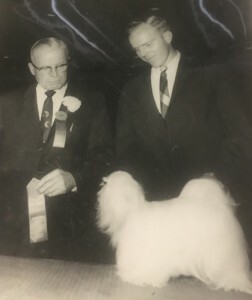 Can you guess the professional handler that is pictured showing a Maltese? Can you name the judge? The correct answer is Handler: Stan Flowers and Judge: Maurice Baker. Thanks to Daryl Martin for this photo and to all who participated! Posted by chesliepickett on May 10 2018. Filed under Featured, The Buzz. You can follow any responses to this entry through the RSS 2.0. Both comments and pings are currently closed.